Sports, as the saying goes, is the gift that keeps on giving. This past weekend was one of the most diverse and interesting in recent memory with important stories that re-wrote the sports landscape. Cristiano Ronaldo won his fifth Ballon d’Or as the best soccer player in the world, tying Lionel Messi for most all time. As both he and Messi are on the opposite side of 30, this sets the stage for a thrilling next few years to see which of the two can fade into the sunset with the distinction as the best ever. Giancarlo Stanton was traded the the New York Yankees, proving the rich do often get richer. Pairing him up with Aaron Judge is a dream core and the Yankees didn't give up their best prospects, either. Baseball is better when the Yankees are good. Frustrating, but better. Toronto FC won the MLS Cup in a dominating performance over their arch nemesis, the Seattle Sounders. 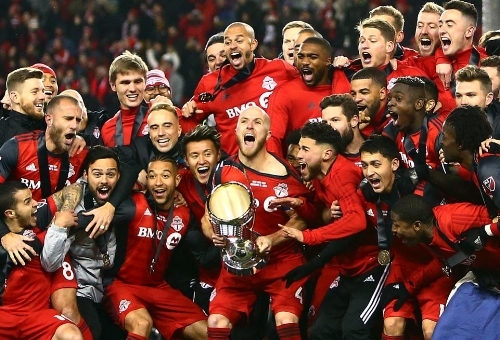 In winning the Cup, the Canadian Championship, and Supporters Shield, Toronto became the first MLS team to win the treble thus establishing this season as one of the best in MLS history. As important, because sports is often about context, they did it by kicking their 2016 MLS cup loss to the Sounders far into the distance. That's how you bounce back emphatically. Widely considered the one of the two or three best pound-for-pound boxers in the world, Vasyl Lomancheko put on a show against fellow two-time Olympic gold medalist and fellow pound-for-pound great, Guillermo Rigondeux. Though the outcome had long since appeared inevitable for Lomanchenko, who utterly outclassed Rigondeux from the get-go, it was a hand injury to Rigondeux which ended the fight. It brought to mind the infamous 'No mas!' between Roberto Duran and Sugar Ray Leonard. Philadelphia Eagles quarterback Carson Wentz tore his ACL diving for a touchdown. The injury renders the NFC playoff picture wide open but also the MVP award race and Super Bowl odds, as well. Seattle defensive lineman Quinton Jefferson tried to climb into the stands to confront a fan who threw a beer at him. When he was restrained by security, more beers followed and he had to be physically guided into the tunnel. Secuirty were slow to act and it felt like we were moments from witnessing a reoccurrence of the infamous 'Malice at the Palace'. The Manchester Derby was one to remember with a Derby tie that, for the first time in many years, actually meant something. Manchester City came away looking the better team (as they have in every minute of every game thus far this year) and won a league-record 14 consecutive games – breaking the record previously set by, you guessed it, Manchester United. What’s more, two separate incidents in the tunnel and the visitng dressing room (one which left Man City assistant coach, Mikel Arteta, bleeding from milk being thrown at him. Yup. Milk.) showed that this rivalry was truly as supercharged as it appeared. It was wild weekend in sports during one of the busiest times of the year. It's nice to have a weekend like that to make you stop and appreciate just how much entertainment the world of sports can provide.